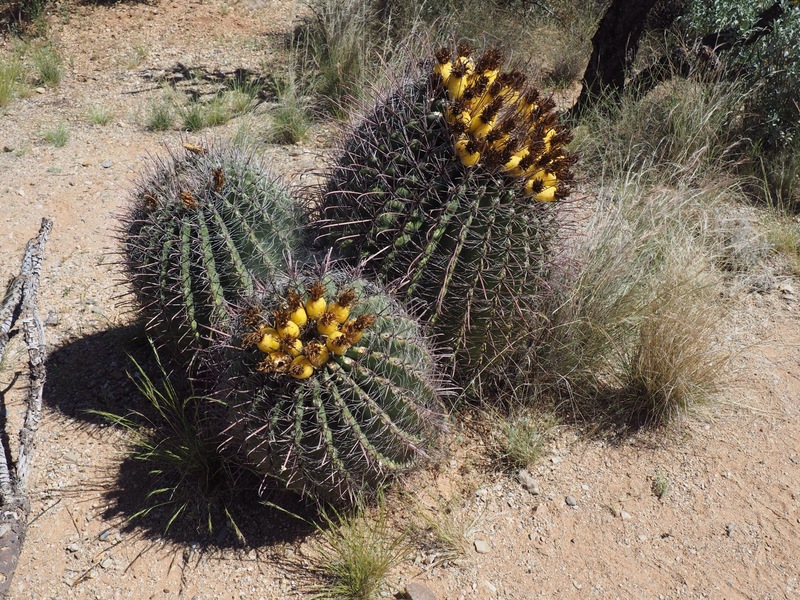 We hadn’t planned on spending so much time in Arizona, but after a chance conversation with another couple several days ago, we found ourselves exploring the Chiricahua (Cheer-i-ka-wa) Mountain region of southeastern Arizona. 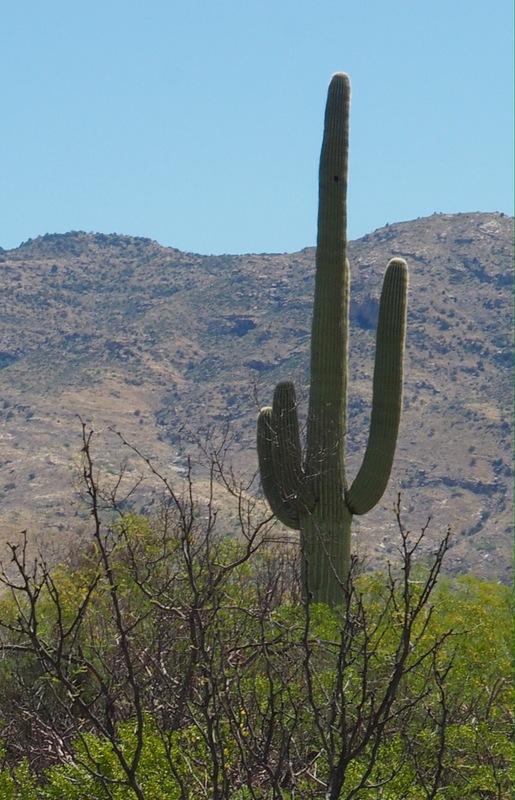 As the U.S. expanded westward, establishing a southern route to San Francisco brought the U.S. Army into direct conflict with the Chiricahua Apaches (including such famous figures as Cochise and Geronimo) who claimed the land as their own. Chiricahua National Monument and Fort Bowie National Historic Site were both well worth a couple extra days in this wind blown part of the state. 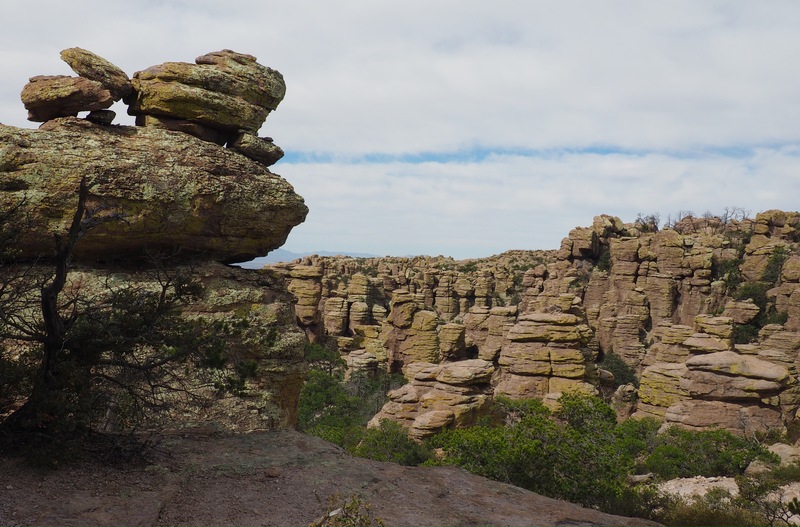 Chiricahua National Monument offers early morning rides to the top of Echo Canyon from the Visitor Center. We took full advantage of the opportunity, enjoying a leisurely 4 mile walk back through towering pinnacles that seem to defy gravity. 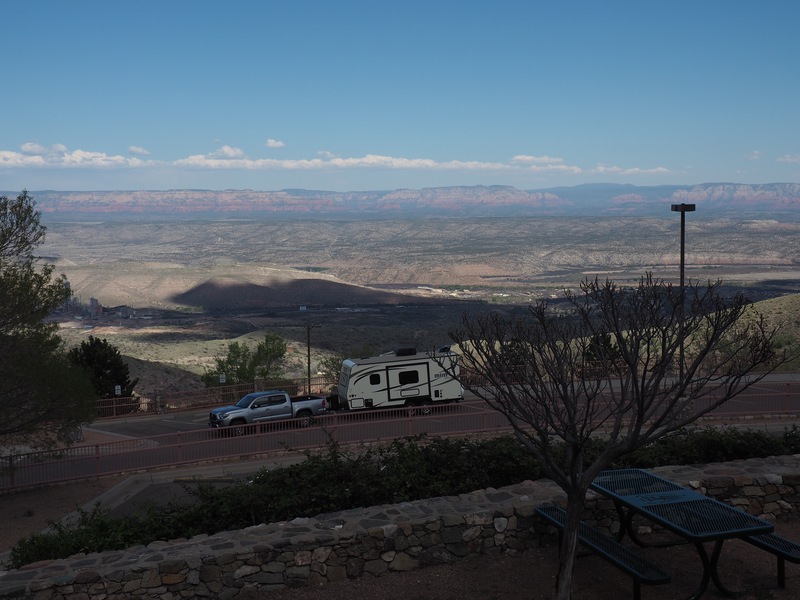 A short drive up a dirt road led us to the trailhead for the mile and a half hike to the remains of Fort Bowie (Boo-y) where we would learn the history of the 20 year fight for control of Apache Pass. Markers along the trail told the history of the tumultuous times. Both Americans and and Apache are memorialized in the small cemetery. 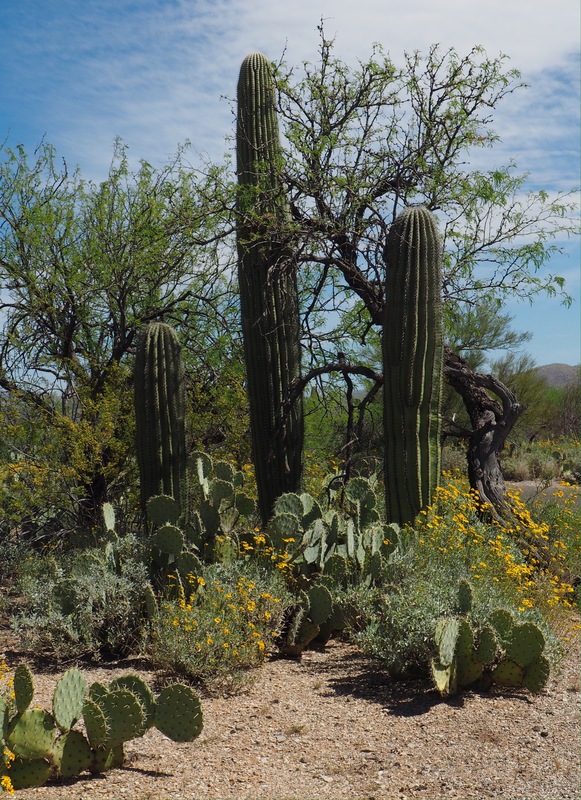 With time to fill between stops in Arizona, we took a short detour toward the Rincon Mountain District and Saguaro National Park (East). 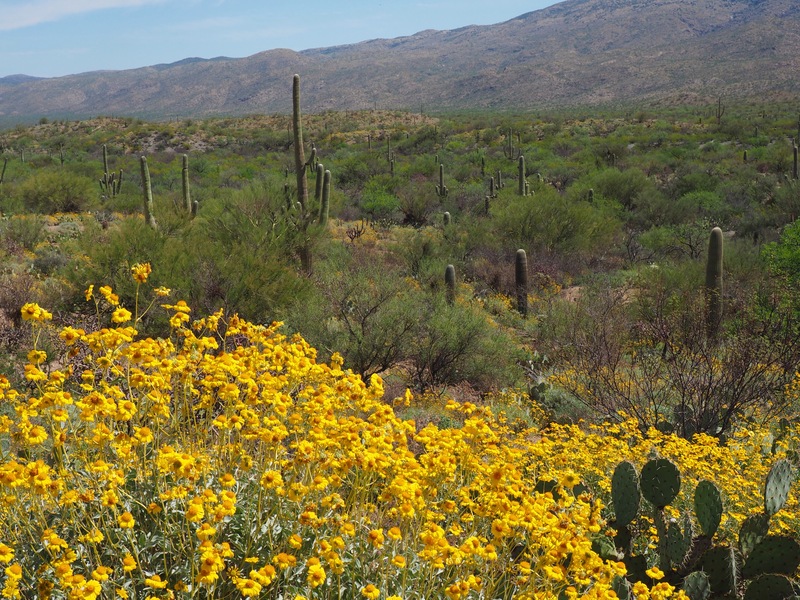 Unfamiliar with what the park offered, we once again found ourselves leading the trailer along a narrow, scenic 8-mile loop through a historic cactus forest. It felt a little bit like a ride at Disneyland as we slowly followed along, single file behind other park visitors. We were pleased to find a number of pull-out spaces roomy enough to allow us to stop and take in the views. With just three days to cover 2,200 miles, we had our work cut out for us. I know your asking yourself, “What in the world were they thinking?” Well, truth is, we probably didn't have our thinking caps on when we cooked up this adventure, but it sounded good at the time…and as it turned out, we did have a pretty good time! Reg and I crawled out of bed in the wee small hours of the morning with plans to drive straight down Inerstate 5 – as far south as we could. Our destination: Austin, Texas…a state neither Reg nor I had ever been to. 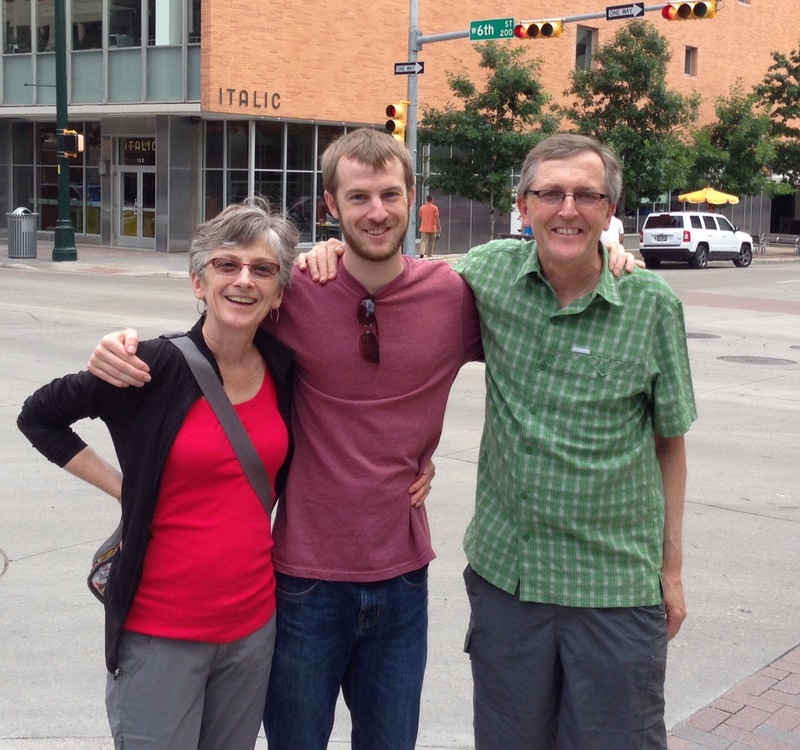 Our goal: To deliver our Subaru to our son Brad who was visiting a friend in Austin. Ultimately, the car will find a new home in West Virginia with our son Chris and his girlfriend, Gail. Brad is on his way there as I write this. Another early morning on day two as we left Blythe and California behind. 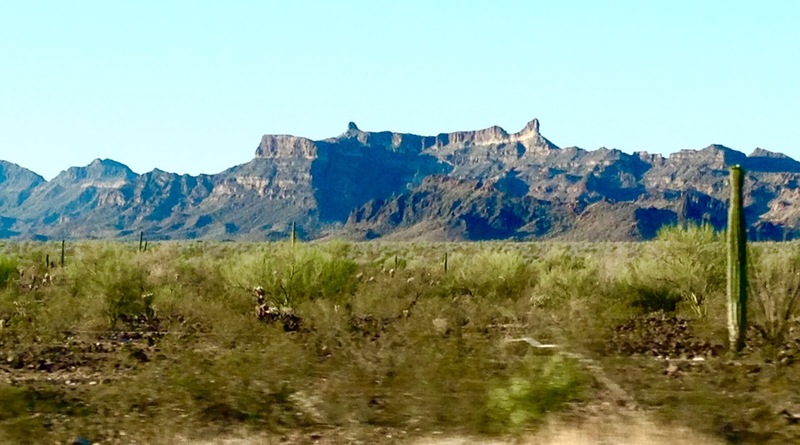 No time for sightseeing, so I snapped this shot of the Arizona desert as we sped along the interstate. 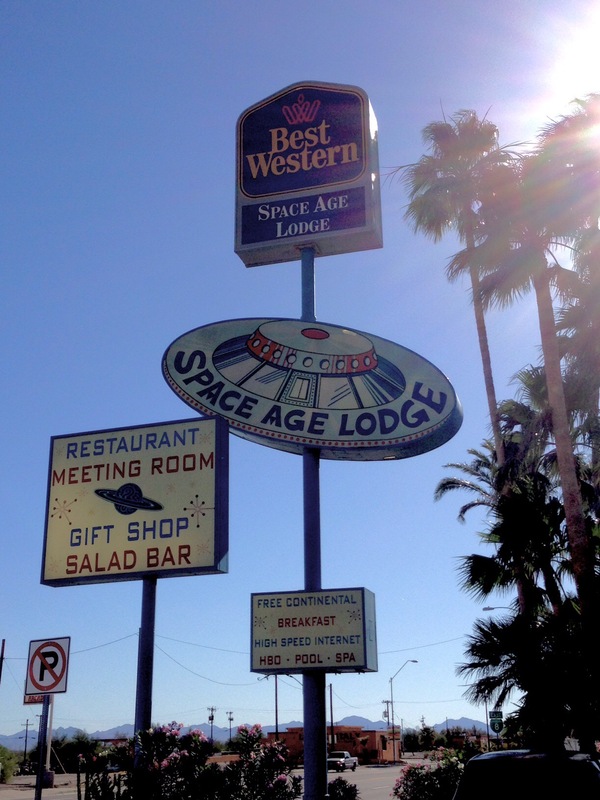 We stopped for breakfast in Gila Bend, Arizona where this sign captured our attention. Not only was it the best breakfast in town, but it was the only breakfast in town! 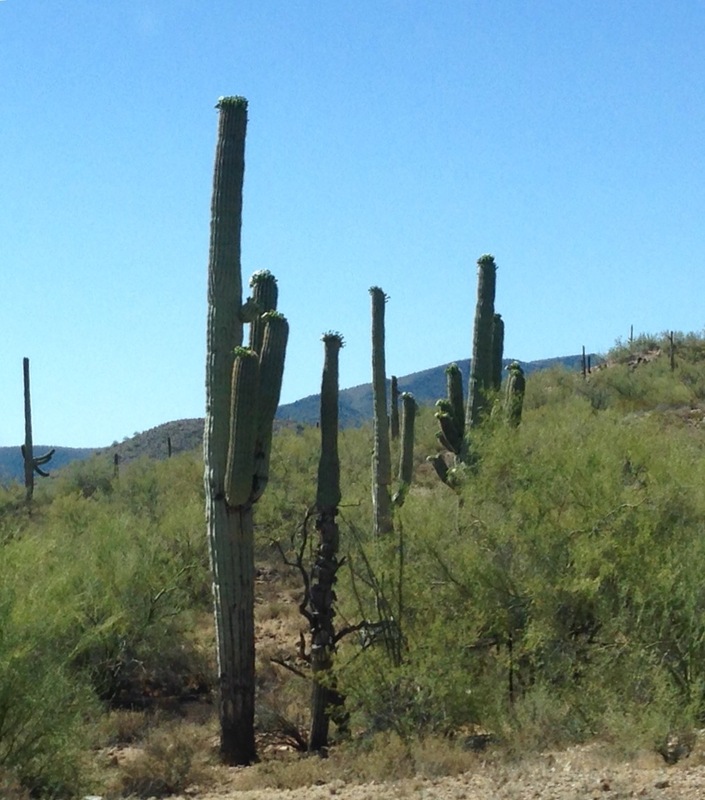 Another window shot as we speed past mile after mile of the iconic Saguaro Cactus that cover southern Arizona. Day two draws to an end and we seek lodging in Van Horn, Texas. A wide spot in the road you might think, and you'd be right. 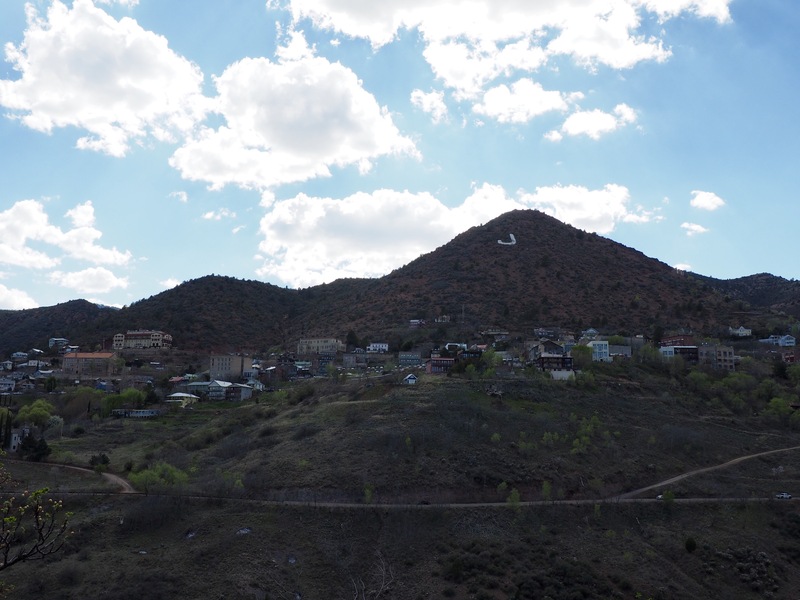 But this little town has a claim to fame and it's not just the Friday night Karaoke. 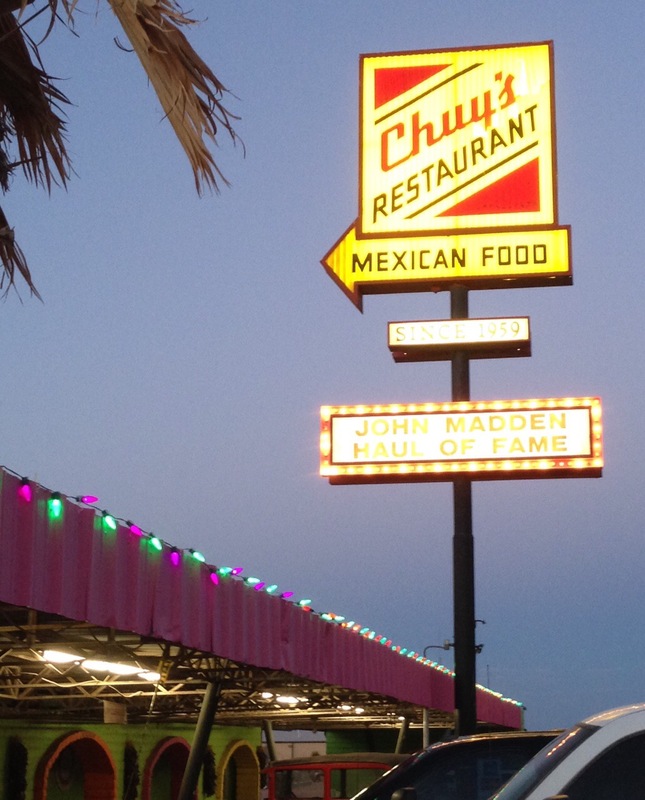 Chuy's, we learned, is home to The John Madden Haul of Fame, where there is an abundance of memorabilia on display. It is well documented that former NFL player and television commentator John Madden doesn't like to fly, and during his TV career he preferred to travel in his private coach, watching football games along the way. In 1987, reception was not great while traveling by coach along this stretch of Interstate 8, so Madden had his driver pull over at Chuy's Restaurant, where he sent his assistant in to search for a clear picture. The rest, as they say, is history. Madden was able to watch the game while enjoying Chuy's delicious Mexican cuisine, a combination that proved so successful that he returned year after year. 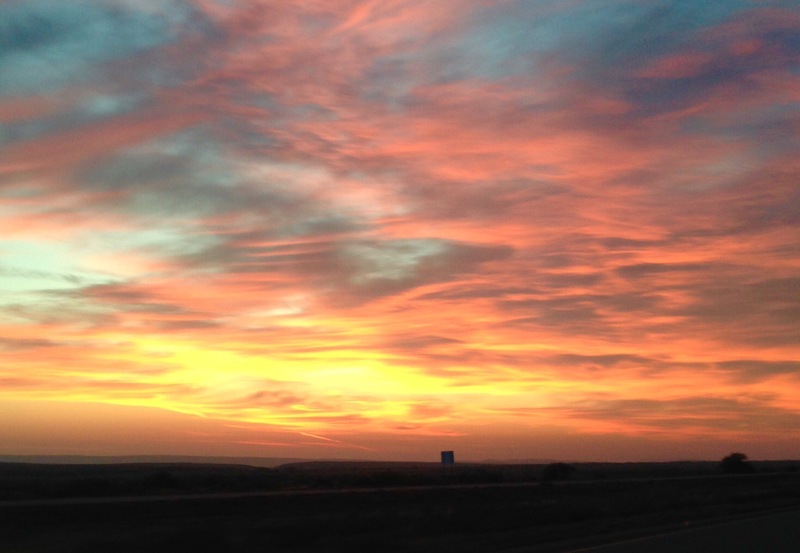 We said good bye to Van Horn, Texas well before daybreak and were rewarded with a beautiful sunrise as we drove east. We reached Austin right on schedule, a little road-weary but eager to see downtown. 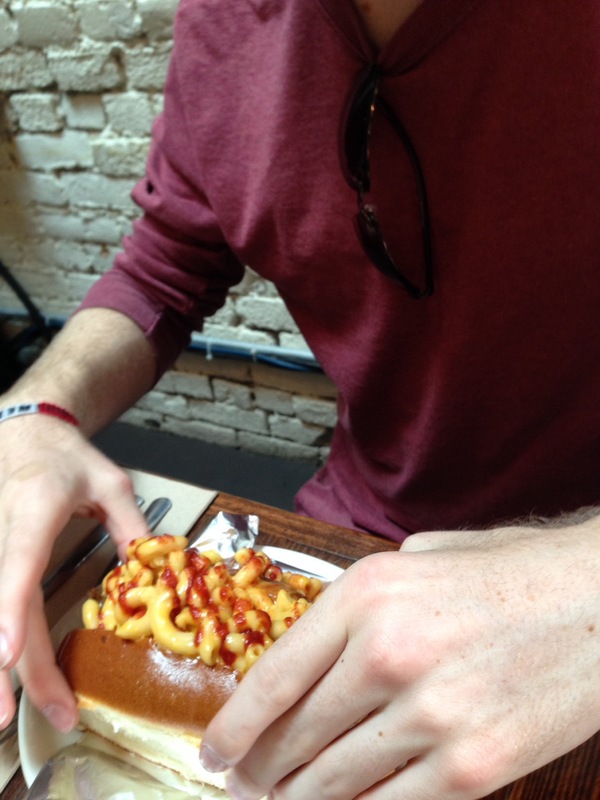 Here's Brad getting ready to devour The Notorius Pig, a macaroni and cheese covered hot dog offered at Franks Restaurant in Downtown Austin. This is what we hoped to see, however we had no idea how spectacular the remains of these ancient dwellings would be. Below, The White House is the only site that visitors can access without a guide. There is a two and a half mile trail from the rim to the valley floor…but more about that later. The White House Ruins are a must-see. 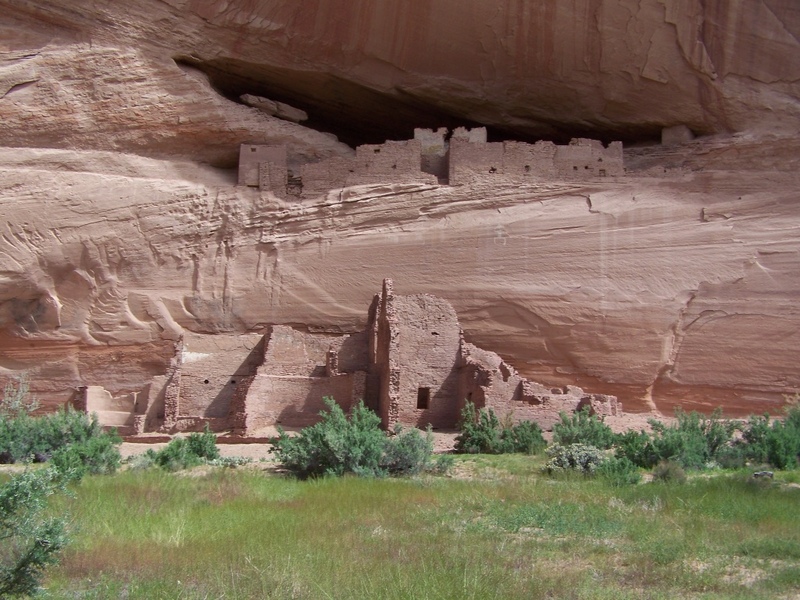 Canyon de Chelly has been inhabited for nearly 5,000 years. 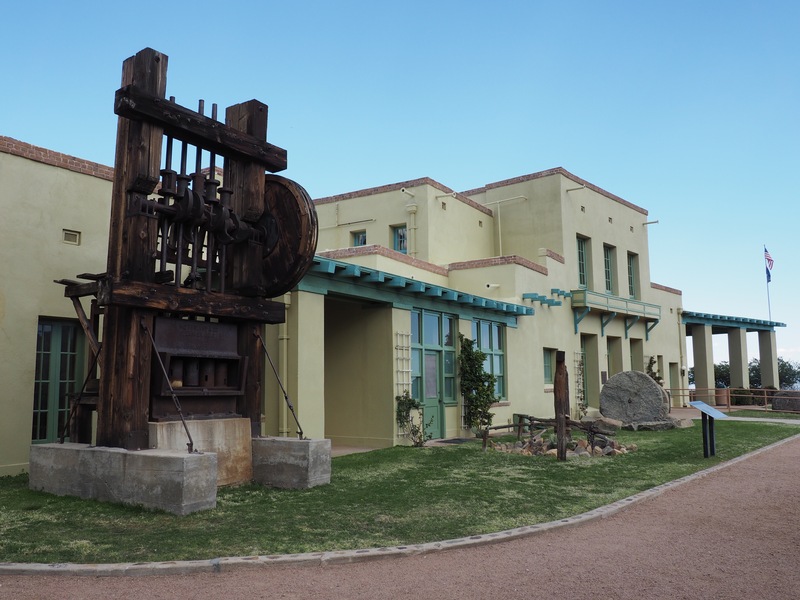 It is currently part of the Navajo Nation and serves as the cultural and geographic heart. We were up bright and early for our 9:00 am canyon tour. 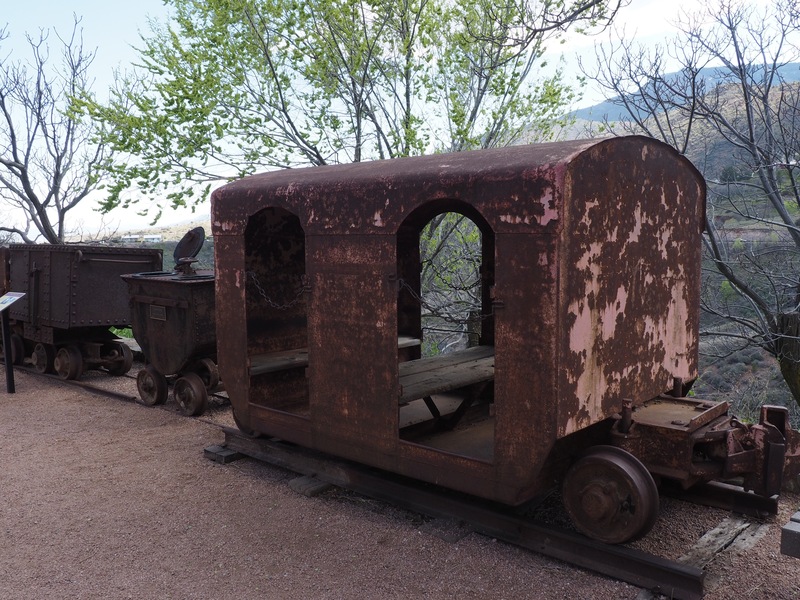 If you want to really see the canyon and learn about the history, this is the way to go. It was a wild ride! Access to the canyon is through a seasonal wash. Our tour guide, Francine, picked us up and we were joined by another couple. We all piled into her (aptly named) Ford Expedition. Francine was a fearless driver as she plowed upstream, through the water and across the rocks and into and out of the gullies. 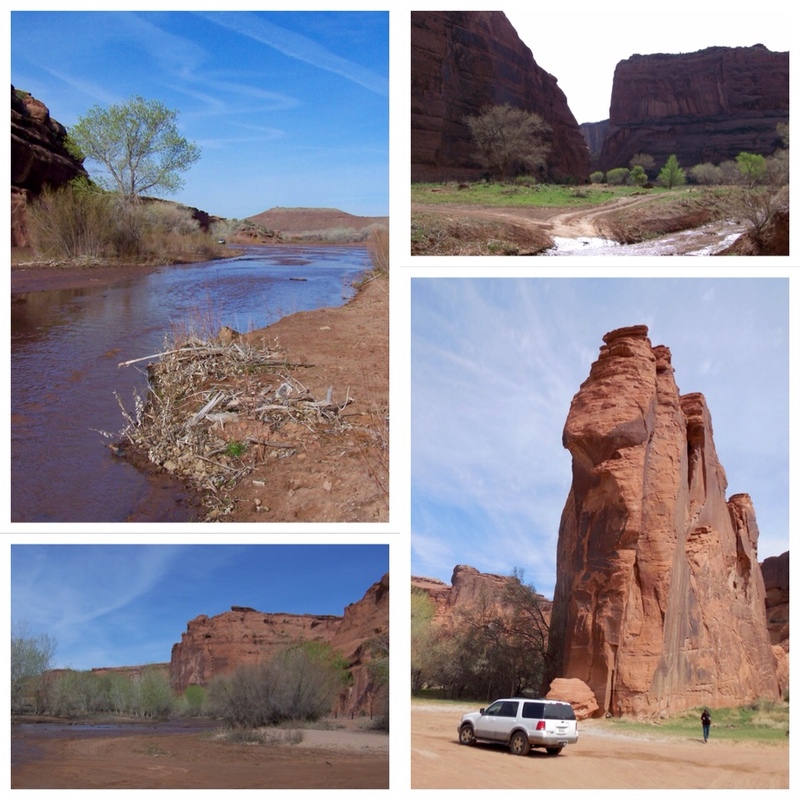 The top left photo shows the access through the wash. We drove through the water for the first quarter mile, passing a pickup truck firmly stuck in the mud. Francine thought the occupants had a little too much fun racing up and down the river the day before. Several young men were trying to dig the truck out. The canyon narrowed and scenery became more beautiful as we drove upstream. Francine warned us that the three-hour tour would go by quickly, and she was right. 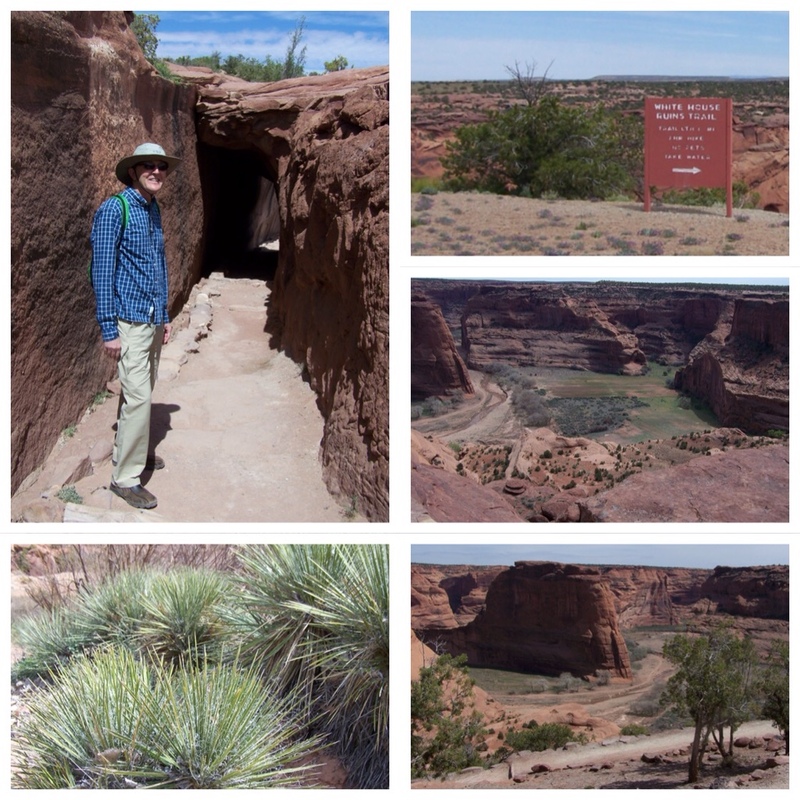 We arrived back out of the canyon filled with more facts and figures and anecdotes that any of us could remember. It was a great morning! Reg and I headed back to our room to grab lunch from our trusty ice chest…then headed right back to the park to try the hike down to The White House ruins. It was time for some exercise! The weather was warm and the wind was calm. A great day for a hike to the bottom of the canyon.